For the second time this school year, Betsy DeVos got a judicial smack down for attempting to eliminate regulations from the prior administration. In September, it was over protections for student loan borrowers. Yesterday, it was over racial disparities in special education. In both cases, DeVos’s justifications for reversing Obama-era regulations amounted to little more than "I'm in power now and I don’t like Obama’s regulations.” The dressed up justification has been that the Department needs to pause the regulations so that it can “study” the issues more. The problem, the federal courts have told the Department, is that it cannot just scrap regulations because it doesn’t like them, particularly when those regulations have already gone through a rigorous process of notice, comment, study, and justification. Reversing existing regulations requires a showing that the existing regulations are wrong. That requires evidence and logic—something that does not seem to interest the current administration. So Betsy DeVos wants to spend federal education dollars on guns. Hats off to Erica Green at the New York Times for a detailed explanation of how federal education dollars can and can’t be spent and the focus of a relatively obscure piece of the federal education funding pie. She interestingly points out something I did not know—that most federal education grants specifically prohibit schools from spending them on guns. But there is a larger point to be made here and it is not about federal funding restrictions on gun purchases or the wisdom of guns in school itself. The larger point is about how small this administration has become. Think about the big issues of the past year: education protests, long term trends in school funding and teacher salaries, state accountability plans under the Every Student Succeeds Act, school segregation, affirmative action, declarations that state school systems are constitutionally inadequate, and DeVos’s favorite—school choice. School safety, of course, was among these issues. That debate, however, was about what strategies could make schools safer. More counselors? More school resource officers? Armed teachers? That is what makes DeVos’s musings so remarkable. Regardless of the wisdom of arming teachers, this particular policy item is an enormous overreach of power on an insignificant matter. She could be working on finding solutions to things that students in poor schools really need, but instead she is devising strategies to get around Congressional restrictions so she can reallocate federal dollars in ways that no serious and substantial constituency cares about. Why? For a headline. To please constituents who only care about headlines and narrative. To be able to say she did something, when really she did nothing. And the fact that this is what DeVos is spending her time on shows just how small and insignificant this administration is to the quality of educational opportunity in the country. When Betsy DeVos first sought the Secretary’s office at the Department of Education, I was disappointed, but not all that worried. The Every Student Succeeds Act (ESSA) had already gutted most of the Department’s power. Only the most skilled and knowledgeable education leader could make a discernible difference one way or the other. DeVos simply wasn’t up to the task. She showed herself to be ignorant and relatively disinterested in things that mattered. For her, the job would be more akin to a disappointing vacation of a niave traveler. For the rest of us, we need not worry. How much damage can naive travelers do? Yes, they may stand in the middle of the sidewalk. Yes, they may be rude to service workers. But in the end, they are, at worst, annoyances. They don’t have any meaningful effect on city policy. DeVos, however, is showing she isn’t content to fit this mold and I may have been wrong all along. She may be ignorant and full of bad ideas, but she is not naive. Nor is she content to serve out her role as an irrelevant itinerant. She is deadset on wreaking havoc and using every ounce of power she has to do it. While I have long explained that the Secretary of Education now lacks the power to tell states how to comply with the Every Student Succeeds Act, DeVos doesn’t care. She has found some “play in the joints” of the Act and is leveraging it for everything its worth. And in doing so, she is doing the exact opposite of what she promised. The report not only explains the ways in which implicit bias – subtle, subconscious beliefs on race – held by teachers, administrators, and school resource officers (SROs) leads to the over-disciplining of students of color, but offers a range of recently developed interventions that have been effective in limiting the harmful effects of implicit bias. Civil rights advocates, as well as the general public, have long been aware of racial disparities in school discipline. As early as 1974, civil rights advocates highlighted that Black students were two to three times more likely to be suspended than white students. Sadly, little progress has been made in reducing these disparities. In 2012, for example, Black students made up only 17 percent of students in the United States but accounted for 40 percent of out-of-school suspensions and were three times more likely than white students to be suspended or expelled from school. While six percent of all K-12 students received one or more out-of-school suspensions during the 2013-14 school year, the percentage was 18 percent for black boys; 10 percent for black girls; five percent for white boys; and two percent for white girls. This wide racial disparity persists despite gender and age differences. The disparate punishment for Black students in our nation’s schools can have dire consequences beyond their K-12 school experiences. Once a Black student is suspended, the chances that he or she will drop out of school, become unemployed, and enter the criminal justice system rises dramatically. New interventions that put more attention on student-teacher relationships and the social and psychological factors contributing to these relationships have begun to lessen the extreme levels of discipline administered to Black children. The report discusses a number of these strategies, including the “wise feedback” intervention, which focuses on providing clear feedback in a manner that prevents students from believing that the teacher may harbor a negative bias against them. Another technique detailed in the report is the “empathic discipline” intervention, which exposes teachers to their kids’ personal stories so that they can gain insight into the experience of racially stigmatized students in school. This exposure encourages teachers to use discipline as a chance to build a relationship with the student and cultivate a learning opportunity. Beyond these interventions, the report also offers specific recommendations for school districts on how to better address implicit bias, and how to mitigate the harm caused by discretionary offenses and school resource officers. These recommendations have already shown promise in ameliorating the over-disciplining of students of color, and in creating a safer learning environment where all students feel inspired to succeed. The report was published with the guidance of the Legal Strategies Collaborative, a group of 15 organizations that focus on limiting the school-to-prison pipeline, and was made possible by a grant from the Open Society Foundations. The report could not be more timely given that Kenneth Marcus, the nominee for Assistant Secretary in the Office for Civil Rights at the U.S. Department of Education, had his confirmation hearing yesterday. Edweek reports that he was thoroughly grilled on school discipline issues. The Office issued guidance a few years ago that spelled out a clear framework for evaluating racial disparities in school discipline. Pursuant to that guidance, the Office forced corrective change in a number of school districts. The question now is whether Marcus would continue that policy. Here are a few exchanges from the hearing. His answers were relatively moderate all things considered. He was not hostile to the guidance at all, which sets him apart from many others on the right. And the fact that DeVos did not rescind the guidance during her recent hatchet job on education regulations is somewhat comforting. With that said, Marcus is extremely sophisticated and previously served in the Office during the Bush administration. I would not expect him to make a fool of himself during a hearing or even invite confrontations that he could avoid. Unlike so many other nominees, he actually understands government and what this Office is supposed to do. Marcus clearly understands the law and it is not his mission to undermine it or the Office. He and I have debated before and we, of course, disagree on the substance of any number of important issues. Once we get past basic threshold questions or the application of the law, we begin to diverge. And the way he dealt with anti-Israel protests on college campuses a decade ago raises major red flags and has drawn a lot of letters in opposition to him, including from professors. To be fair, however, the legal rationale that he relied on with the anti-Israel protests was the same rationale that he and the Office used to protect Sikh and other religious minorities from harassment in school following the 9/11 attacks, although the harassment of Sikh's was far more direct and clear. This leads many to believe that while Marcus won't undermine the Office, he will, from time to time, use it for his own ends. Am I happy that he will lead the Office? Absolutely not. Do his pet projects bother me? Absolutely yes. Is he competent, generally reasonable, and better than a host of other people I might have expected Trump to nominate? Absolutely yes. In short, he is a mixed bag. In Abandoning the Federal Role in Education: The Every Student Succeeds Act, I detail the numerous ways in which the Act eliminates federal leadership in education and leaves states to implement almost any sort of accountability system they can dream up. The shift in power is so significant that Act does not, as a practical matter, demand accountable. Instead, it demands the appearance of accountability. This, I argue, allows states to manipulate the system. The article did not consider the possibility of in-fighting within state bureaucracies. The paper, for the most part, speaks of the "state" as a monolithic unit. It focuses on the worst case scenario in which the legislature, state department of education, and powerful school districts are all in favor of an accountability system that covers up their failures. Not all states, however, will fit this framework. Recent events in Alabama suggest that, once one moves beyond that framework, curious disagreements can happen at the state level. [Michael] Sentance was hired by the [Alabama state] board in August of last year to replace longtime Superintendent Tommy Bice who retired after a years-long battle over the expansion of charter schools and a dispute between the state and local officials over how to rank the state's districts and schools. Sentance quickly ran into political turmoil as he traversed the mostly rural, economically deprived, ethnically diverse and politically conservative state to gather thoughts on what the components of the state's ESSA plan should be. Meanwhile, the state's department began to take over Montgomery Public Schools, one of the largest districts in the state, a process Sentance said would bring stability, autonomy and school choice, but which parents and school officials called unfair. He sided with district superintendents in a debate over whether the state should keep or get rid of its A-F letter grades of schools' performance. But in an evaluation sprung on him by the state board last month, district superintendents and board members took issue with his leadership style and policymaking. "I do not take this situation lightly, and as President of the State Board of Education, I will ask the Board to accept his resignation," Ivey said in a statement. "Over the past two years, Alabama has experienced far too many changes in state government. As with previous changes in leadership positions, we will use the pending resignation of the state superintendent as an opportunity to move forward and begin a new chapter in public education. The article also indicates that the national average tenure for state superintendents of education is barely two years. As a result, there is no continuity between the development, submission, and implementation of ESSA plans. The lesson I take from this story is the possibility that the ESSA may have made some state superintendents' jobs a lot harder. Under NCLB, there was far less flexibility. Beneath the surface, a state superintendent was able to game the state's results, but the metrics and methods of the accountability system were set by federal law. Putting aside the question of whether NCLB was a normatively good law, it set clear parameters for state superintendents. They knew what their job was and had legal cover if legislators or other state political actors criticized them. The ESSA, in contrast, offers states and their superintendents a universe of options. It is almost entirely up to them how they approach school improvement, ranking, accountability, and quality. As a result, there is very little cover for superintendents who might want to do what they think is best for schools and students, but in the process might make the state look "bad." If a state board or state legislature wants to manipulate its accountability system and a state superintendent does not, the superintendent can easily find herself as the odd person out. If these respects, the ESSA accomplishes two distinct and problematic devolutions of power. First, it cedes power to states, which I demonstrate is highly problematic here. Second, even if state power is not inherently problematic, the ESSA incentivizes power struggles and instability at the state level. The first was the specific intent of the Act. The second is likely an unintended negative consequence. Last fall, in Abandoning the Federal Role in Education, I wrote that the Every Student Succeeds Act "moves education in a direction that was unthinkable just a few short years ago: no definite equity provisions, no demands for specific student achievement, and no enforcement mechanism to prompt states to consistently pursue equity or achievement. The ESSA reverses the federal role in education and returns nearly full discretion to the states." As a result, I predicted the Act would lead to vague state plans, obfuscation, widening inequality, and downright confusion. Thus far, most of these predictions have come true. 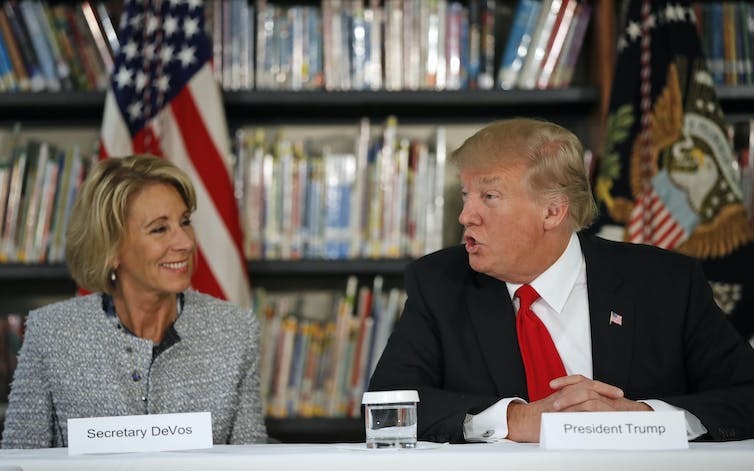 Earlier this year, Secretary DeVos, expecting that Congress would repeal the Obama's administrations ESSA regulations, changed the deadline for states to submit their plans and suggested they would have flexibility in their plans. The problem is that states actually need federal leadership. As of today, less than a third of states have their ESSA compliance plans in. And those that have their plans in have done little to dispel my concerns. As a new report by Bellwether Education Partners and the Collaborative for Student Success reveals, the sixteen state plans submitted thus far do not ensure that all students' performance is counted in state accountability plans. • How will schools be held accountable for the performance of all subgroups of students? • How will schools be identified for improvement? • What steps will schools identified for improvement need to take, and how will they demonstrate they’ve made sufficient progress to exit improvement status? A new NPR story points out that this "should raise some red flags concerning kids with disabilities, English language learners and those from low-income families." States have thrown so many measures of school quality into their metrics that the public is unlikely to know what school quality actually means or what schools are required to do to address it. In the end, these plans reveal the central flaw in the ESSA: its success rests on the extent to which states are willing to engage in good faith efforts to provide equal and adequate opportunities. As NPR writes, parents must simply trust their states. Unfortunately, recent history reveals there is almost no reason to place this faith in states. They have slashed public education budgets, manipulated test scores, and watched school segregation increase. This is not to say that federal reform has been well-crafted. It has not. But the solution is better federal policy, not giving up. Read a summary of the ESSA, its flaws, and proposed solutions here. Nora Gordon and Eloise Pasachoff penned a new essay in Edweek. They implore the public to go back to the basics and engage the notice and comment process that dictates the development of federal policy. For all the objectionable things Secretary DeVos has done or promoted since taking the job, the public push back has primarily been in newspapers. While newspapers provide a means for political accountability, the administration is completely free to ignore them. What the administration must, however, address are the comments that individuals and groups make as part of the formal notice and comment period surrounding changes in federal regulations and guidance. Gordon and Pasachoff remind us that in February, "President Donald Trump called on federal agencies to review their regulations and identify which to cut." DeVos is now digging into that work and has "issued a notice in the Federal Register asking the public to identify 'unduly costly or unnecessarily burdensome' regulations and guidance documents by submitting comments to the Education Department by Aug. 21." This process, however, can be used to do more than target those policies that need to be eliminated, it can be used to focus on things that must be kept (because others will certainly be calling for elimination). Gordon and Pasachoff note various recent changes that the public might comment on, including the "roll back [of] Obama administration’s civil rights protections for transgender students; . . . freezing the implementation of the Obama-era borrower-defense-to-repayment rule, which would shield borrowers from having to repay debt accrued at institutions of higher education that lured them with substantially false information; . . . state ESSA plans[; and] . . . indications that [the Department] intends to change course on the Obama administration’s framework for addressing sexual assault on campuses." Not only do the comments that the public makes require some response (if if only internal to the Department), they require a "cost-benefit analysis to make sure that rules are for the common good." The past four years of the U.S. Department of Education' Office for Civil Rights may have been its strongest in decades. Under Catherine Lhamon, the Office's work expanded substantially. The Office published a number of new guidance documents that made it clear that it would enforce the law, including disparate impact. The symbolism of these documents, along with growing faith in the Office, likely explains increases in complaints to the Department. Unfortunately, the new Acting Assistant Secretary for the Department, Candice Jackson, signals that the coming years may look far different. Jackson was formally named the Deputy Assistant Secretary, which does not require Senate confirmation, and will serve as acting Assistant Secretary until the administration formally nominates someone to that position and the person is confirmed by the Senate. Although her limited background in civil rights law makes it difficult to infer her positions on specific issues, Jackson’s writings during and after college suggest she’s likely to steer one of the Education Department’s most important — and controversial — branches in a different direction than her predecessors. A longtime anti-Clinton activist and an outspoken conservative-turned-libertarian, she has denounced feminism and race-based preferences. She’s also written favorably about, and helped edit a book by, an economist who decried both compulsory education and the landmark Civil Rights Act of 1964. Jackson’s inexperience, along with speculation that Secretary of Education Betsy DeVos will roll back civil rights enforcement, lead some observers to wonder whether Jackson, like several other Trump administration appointees, lacks sympathy for the traditional mission of the office she’s been chosen to lead. Her appointment “doesn’t leave me with a feeling of confidence with where the administration might be going,” said Theodore Shaw, director of the Center for Civil Rights at the University of North Carolina School of Law, who led Barack Obama’s transition team for civil rights at the Department of Justice. Last year, I wrote that the Every Student Succeeds Act “ESSA reverses the federal role in education and returns nearly full discretion to the states.” I predicted that the flexibility afforded to states in devising their new ESSA accountable schemes would make “educational opportunity a random occurrence rather than a legal guarantee.” States would manipulate their accountability schemes and rely on a convoluted set of factors that effectively make it impossible to get a sense of school performance. Nearly 80% of schools serving grades three through eight are ranked as medium- to high-performing in the new ratings, earning them positive colors on report cards sent to parents. Last year in state testing at those same schools, the majority of students failed to reach English and math standards. More than 50 of those schools whose average math scores fell below proficiency receive the dashboard’s highest rating for math. State flexibility is not, as Betsy DeVos claims, being use to unleash the creativity and good faith efforts. It is being used to hide the fact that states are and have been doing a poor job providing equal and quality educational opportunities. To be clear, this does not mean that the No Child Left Behind took the correct approach or that standardized tests should drive school quality. But a common and transparent yardstick for school accountability is important. ESSA is allowing states to devolve into a system of apples, oranges, pears, watermelons, and lemons. By doing so, it deprives us of the ability to compare schools in any meaningful respect. For that reason, the new accountability systems are not simply hard to interpret, they are a complete waste of time. Rather than devise a convoluted accountability system, Congress should have just fessed up to the fact that it was abandoning the federal role in education. Instead, it sought to keep up the ruse by requiring states to waste a lot of time and effort on these new systems. For my full analysis of how the Every Student Succeeds Act abandons the federal role in education and what else is likely to come, see here. The Washington Post reports that the Department of Education has killed funding for one of its few voluntary integration programs. The rationale is pretty flimsy. According to the Post, an official said it was not a good use of money because the funds were for planning rather than implementation. What? Doesn't planning often lead to implementation? Aren't planning grants predicated on promises that districts will implement the plan? I hope this is just a poor excuse and not a guiding principle for future policy: act first, plan later. But if this is just a poor excuse, it begs the question of why the Department is killing this program. Is it anti-integration? [W]e write to express our support for the Opening Doors, Expanding Opportunities program (“Opening Doors”), and urge you to make the awards under this program as expeditiously as possible. As evidenced by the large number of districts from all over the country that expressed their intent to apply for the program, there is tremendous interest in this program and what it seeks to do—namely to use school choice to achieve diversity and increase equity in our nation’s public schools. This program gives parents more options, and will help to expand innovation and educational opportunity. Opening Doors will help combat the rising resegregation we are seeing take hold in many public schools across the country. As the Government Accountability Office noted last year, while schools serving primarily Black and/or Hispanic students represented only 16 percent of all K-12 public schools, they accounted for the majority (61 percent) of high-poverty schools in 2013-14. Diversity is beneficial to all students, regardless of socioeconomic background or race. As you likely know, research shows that students attending socioeconomically and racially diverse schools have better test scores and higher college attendance rates than peers in more economically and racially segregated settings. For these reasons, we urge you to award the Opening Doors grants to qualified applicants as soon as possible. Doing so will provide school districts with locally-developed tools that will foster diversity, which will benefit all students and our society as a whole. Supporting Effective Instruction State Grants program ($2.4 billion): The White House says the program is "poorly targeted and spread thinly across thousands of districts with scant evidence of impact." 21st Century Community Learning Centers program ($1.2 billion): The formula grants to states support before- and after-school and summer programs. "The programs lacks strong evidence of meeting its objectives, such as improving student achievement," the budget says. Federal Supplemental Educational Opportunity Grant program ($732 million): This financial aid program, known as SEOG, help give up to $4,000 a year to college students based on financial need. The Trump administration says it's a "less well-targeted" program than Pell Grants. Striving Readers Comprehensive Literacy Program ($190 million): The grants are targeted toward students with disabilities or limited English proficiency. Teacher Quality Partnership ($43 million): A teacher training and recruitment grant program. Impact Aid Support Payments for Federal Property ($67 million): Obama also proposed the elimination of this program, which reimburses schools for lost tax revenue from tax-exempt federal properties in their districts. International Education programs ($7 million): This line item funds a variety of exchange programs, migrant schools and special education services abroad. My knowledge is thin on most of these programs, but the biggest cuts strike me as the most curious. Funding for before and after school programs may or may not be improving student achievement. That, however, should be beside the point if those programs provide a safe place and child care for needy students. Cutting this out only places more pressure on the child care issues that Ivanka Trump has been raising. Likewise, the Federal Supplemental Educational Opportunity Grant helps needy students pay for college. Trump may be correct that it is not as targeted as it could be, but this begs the question of how it might be better targeted, not whether the funding should be cut. Finally, the Impact Aid Support seems like a particularly odd target. Those funds have a significant impact in communities that serve our military families. Those families, for a variety of reasons, do not pay the same taxes as others in those communities. No one has any qualms with giving our service members those benefits. The downside, however, is that the schools their children attend do not have the same tax base as other schools with fewer military members. To offset this oddity, the federal government makes a direct payment bumps to those schools. This cut is a hard one to figure out.